Among the slew of executive orders that President Trump signed in his first few weeks in office, was one directing the Treasury secretary to submit a report on the review of Dodd-Frank Act (DFA) and recommend changes in 120 days. I believe this is a step in the right direction to resetting complex banking regulations and ease credit flow and kick start the economy. In this context, it is worthwhile to understand the importance of this law and how it has impacted the financial services industry in a post-recession America. The banking and financial services industry in the US contributes over 8% of the GDP and is considered as the life blood of the business and economy of the country. Because of the big economic impact banks have on the economy, it is no surprise that it is the most highly regulated industry in the US and probably in the world. Hence the need for prudent regulations is understood and justified. Therefore, the laws that govern its growth and welfare are expected to be living documents and subject to periodic changes so as to be relevant in a dynamic environment. Hence the executive order to review the DFA is a welcome initiative. The DFA is a big legislation. It is indeed a massive piece of law that runs over 2300 pages incorporating more than 400 rules and mandates. It can be broadly divided into eight key pillars that seek to protect the consumers and regulate the financial markets. Among the key provisions in DFA, are the creation of the Consumer Financial Protection Bureau (CFPB) -which is responsible for implementing and enforcing compliance with consumer financial laws, stringent regulatory capital requirements, significant changes in the regulation of over the counter derivatives, reforms that regulate credit rating agencies, changes to corporate governance and executive compensation practice and the Volcker Rule ( which bans banks from using or owning hedge funds for their own profit). The provisions in the DFA were designed to create and sustain a safe and sound banking industry. For instance, the enhancement of the capital requirements of banks created sufficient cushion to absorb loan losses in an unfavorable economy. It also mandates banks to keep a significant portion of their assets in cash and government securities so that they could be easily liquidated in the event of a run on the bank or fast deteriorating macro-economic conditions. It is easy to see the good intent of the Act. But the experience of banks, regulators and experts since 2010 have been very mixed. As would be expected, experts in the field have sharply divided views on the efficacy of the Act in achieving its stated goals. 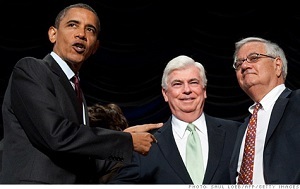 The Dodd-Frank Act had an acrimonious birth and had sharply divided influential Senators and Congressmen. While President Obama claimed victory, the Republicans then had warned that this massive piece of legislation would arrest the flow of credit and slow down recovery and impact job creation. DFA was enacted to safeguard the consumers and prevent a repeat of the financial crisis of 2008. One of its important objectives to end ‘too-big-to-fail’. But what has the DFA achieved in six years? The ‘too big to fail banks’ remain intact. On the other hand, it has adversely impacted small and medium banks by imposing a heavy regulatory burden on them. A study by American Action Forum published in 2016 found that the DFA in six years had cost a total of $36 billion – including $10.4 billion in its sixth year of existence. The study further showed that in the six years, DFA has resulted in a burden of 73 million paperwork hours. DFA has indeed been a logistical nightmare for banks. A Harvard study on the impact of DFA found that the top five bank-holding companies control nearly the same share of U.S. banking assets as they did in the fiscal quarter before Dodd-Frank’s passage. But community banks with $1 billion or less in assets have seen a significant decline. It would be pertinent for me to point out here that often in their zeal to protect consumers, legislators tend to over-regulate to the point of almost killing the industry. Human history is replete with instances where laws are often enacted as a knee-jerk panic reaction in the aftermath of a crisis. But these very same legislations are rued over by the same legislators when the crisis has passed and the severity of their actions dawns on them. We have seen this happen periodically in America, Europe and elsewhere. Is it the legislators’ curse on the democratic world - killing us with their concern and zeal? As a former bank regulator, I have been an advocate of minimum and prudent regulations that achieve the stated goals by imposing minimal financial costs on banks and regulators. Complying and supervising well-intentioned legislations must not by itself be a Herculean task. I have always believed that DFA has been a logistical and expensive nightmare for the bankers and the regulators. To pass the smell test, a law has to be simple, unambiguous, easy to implement and enforce and achieve its stated objectives with ease. On all these counts, in my view, the DFA fared poorly. But that is not to say that I advocate the repeal of the law. By no means. The Feds need enabling and powerful laws to maintain a disciplined financial system where banks power the engines of growth by funneling credit flows to big and small consumers alike to achieve sustainable business growth. The review is a welcome move and hopefully make DFA easier and less expensive to comply. The Trump administration has to exercise caution to not bring in legislations that are too big and expensive to administer, comply and enforce and carry the risk of collapsing under its own weight. The incoming administration has a great opportunity to make a big difference. President Trump has taken the right steps to review the Dodd-Frank Act.